The laundry revolution from Japan – cleans and deodorises with no detergent needed! 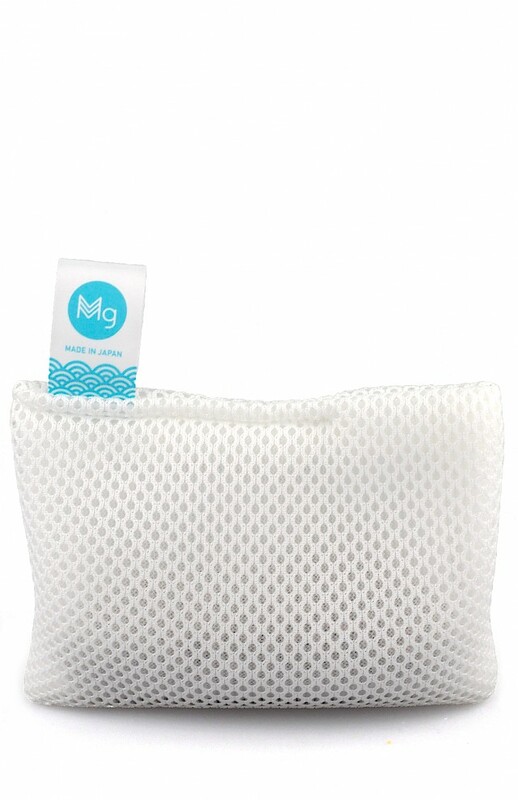 Laundry Magchan uses the power of magnesium to clean your laundry. Laundry Magchan is fragrance-free, textile friendly and antibacterial without the use of synthetic chemicals. It removes odours, cleans laundry and leaves no traces of toxic substances that harm water and the environment. For use in all washing machines; in both soft and hard water/cold and hot water. No suds means no need for rinse cycle, saving power and water consumption. Laundry Magchan is filled with highly purified magnesium pellets which are specially processed with innovative Japanese technology. When the magnesium comes in contact with water, it generates bubbles of hydrogen and forms ionized alkaline water with an increased pH of approximately 10.5. This ionized alkaline water has the ability to remove/eliminate dirt, sebum, mould, bacteria, and odour leaving you with fresh, safe, and clean laundry! Place Magchan into washing machine together with dirty laundry. Set to include soak cycle for 15–20 minutes to allow for the hydrogenated alkalized water to work with the dirty laundry for cleaning effectiveness. If preferred you can skip the rinse cycle as Magchan produces no suds. After wash cycle is complete, hang Magchan to air dry. For consecutive loads, Magchan may be used without drying. Note: Because Magchan does not contain chemical bleaching or brightening agents, for tough stains, we suggest applying stain remover on stained areas before washing. Caution: DO NOT USE with chlorine-based detergent or bleach. Replace when weight of bag has reduced to 70g. The magnesium pellets may then be added to your garden to enrich your soil. Pure, natural Australian lake salt enhanced with our unique ionic magnesium bitterns. Rich, hydrating cream with a powerful combination of organic magnesium and native Australian Quandong extract for skin health. Loved how my daughter's clothes comes out smelling fresh, without any fragrances.. I tried magchan on her undergarments, pillow cases, sweaty school uniforms, bath towels & all comes out nice & clean feel.. Most importantly, it doesn't cause her any irritations to her very sensitive skin .. definitely a good product to rely on, highly recommended!! I'm thrilled with my first wash! I wear linen pants and yakka work shirts when daily working with dogs, my clothes get covered in red dirt, no grease, and thrilled with how clean they turned out. I have been using the Magchan for over a month now and couldn't be more delighted with the way it magically performs! This little bag of brilliance is truly awesome. My whites look fantastic, husbands workshop clothes look great, and even silk/delicates in a wash bag come out clean and bright. Highly recommend to anyone, one of these fantastic money saving, great for the environment additions to your cleaning regime.